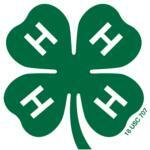 The 4-H Youth Development Program is an educational program of the University of California Cooperative Extension and is made available through a partnership of county, state, and federal governments. The program creates positive opportunities for youth to develop life skills and become engaged in their local communities. The program combines the efforts of youth, volunteer leaders, and University staff and faculty to create a fun, hands-on learning approach to a non-formal education. An emphasis is placed on learning citizenship, leadership, and life skills. Head: By exercising independence through 4-H leadership and project opportunities, youth mature in self-discipline and responsibility and learn to understand themselves better. Heart: The 4-H program cultivates a strong sense of connection and belonging, giving youth the opportunity to feel safe physically and emotionally while actively participating in a group. Hands: Within the 4-H program, youth can connect to communities and learn to value generosity and give back to others. Health: Youth need to feel and believe that they are capable of solving problems and meeting challenges to develop their self-confidence. By exploring 4-H projects and activities, youth develop a sense of mastery, gain life skills and are more equipped to make positive career and life choices.